Washing your windows consumes a too much time and exhausts you? You can make a change now – just contact our representatives and order our window cleaning in East India. We will deal with this matter for you and the outcome will be perfect for all parts of your windows – the glass, framework and sills. With our assistance, you will have the flexibility to do everything you want with the time you normally spend for window washing. And our services will give you even more, as you can notice from our list of benefits. We also provide our professional services in nearby areas: Westferry, Mudchute, London Arena, West India Quay, South Quay. With our experience and workmanship, the great look of your property will be accomplished quickly – the specialists of commercial window cleaning will achieve this. 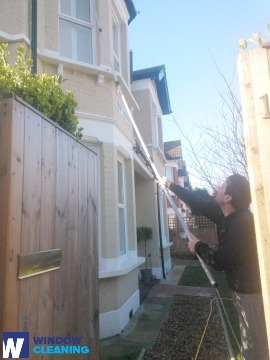 We employ water-fed extension pole system for quick and efficient window cleaning, up to the fourth floor. For office buildings taller than that, we use up-to-date rope access methods. With our gear, we can reach the highest glass panes, even on the the highest buildings London is so famous about. From small shops to towering business edifices, we guarantee top-notch services – take advantage, now! You can depend on the team - they are one of a kind specialists of window cleaning. They all have passed through diverse training sessions, so you can receive efficient assistance for all window types. What we can clean includes: single, double, sash or bay windows, garden windows, patio doors, French doors, greenhouses and skylights. Your house can freshened instantly with our aid. Call us every time you need great window cleaning for your home or office. We use the most advanced procedures to be sure that you take advantage of highest quality window cleaning. With our water-fed extension pole system and high pressure cleaning methods, you will enjoy crystal clear look of your windows. We connect our poles to water reservoirs in our vans to ensure that there is no risk for the exterior of your residence or business premise. For high-rise windows, we utilise entirely secured rope access method. You can use the advantage of these cleaning techniques now – just ring 020 3746 3113! Take advantage of our home window cleaning in East India – we provide top-notch services for your home on affordable prices. We use purified water to clean the windows inside and out. We use ground-based water-fed pole technology. Contact us now - dial 020 3746 3113 or just use our booking form. Our operators will help you request a window cleaner and answer any questions. You will appreciate the results of our household services, we guarantee that!